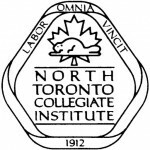 North Toronto Collegiate Institute is a diverse and inclusive community of staff, students, and parents who cultivate a tradition of excellence both within and beyond the classroom. We foster creativity and critical thinking through our academic, artistic, athletic, environmental, and global education programs. Student leadership and school spirit produce a rich variety of extra-curricular opportunities, shaping our culture of involvement, commitment, and caring. Our school community ensures a safe, welcoming, student-focused environment where all can discover their potential through growth in knowledge, skills, and confidence. Our twenty-first century facilities and technology support learning that enables students to act as responsible and engaged citizens in an ever-changing world. Website Administrators: We are always LOOKING FOR NEW STUDENT ADMIN! Contact Mr. Kinoshita in room 412 if you are interested.